How can you be strategic about your career and goals while being true to yourself and treating the people around you with empathy and encouragement? 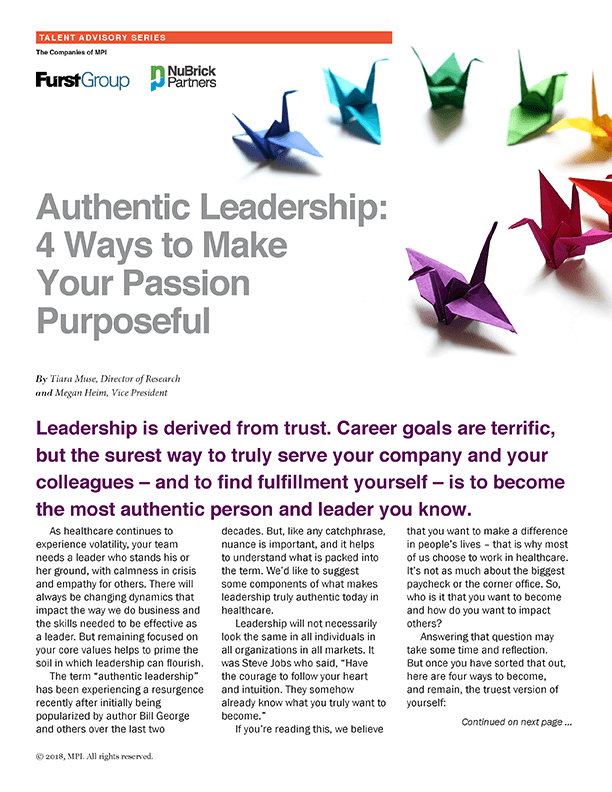 That’s the focus of our latest article, “Authentic Leadership: 4 Ways to Make Your Passion Purposeful,” which is featured in the new publication from the Chicago Healthcare Executives Forum, part of the American College of Healthcare Executives. Written by Furst Group’s Director of Research Tiara Muse and Vice President Megan Heim, the article makes a strong case that leadership is based on earned trust – and that the surest path to trust is by allowing yourself to be transparent with your team and letting qualities like empathy and humility shine through. Look out for your team and embrace opportunities for them to grow into their own leadership skills as well. Leaders should also be self-aware, cognizant of their strengths and areas that need development. Mentors can be helpful in this area, as well as discussions with executive recruiters, who are well-networked in the healthcare industry. But don’t overlook the counsel of peers as well. When it comes to career development, they add, remain flexible and “maintain the posture of a continuous learner” to prepare yourself for unexpected twists and turns. “Many aspects of your career may change in the next 5 to 10 years – the pace of innovation and disruption accelerates every year,” they add. Finally, Muse and Heim counsel executives to be aware that their behavior – including the use of social-media platforms – can build their personal brand and reputation, so treat your career and the people around you with care. “The power of storytelling,” they note, “is a vital skill” for all leaders, not just marketing executives.